The Battle for Medina Tri - So it begins. So if you read this post: Campaign rules you know I was planning to make a campaign. And here we are! Week 1 starts on Monday. It will be a slow start (the map was designed in such a way actually) and then we will see what happens! If players are aggressive we might have some fighting turn 2 all ready! I will try to write battle reports for my battles during the campaign at least, and with a bit of luck we will get a couple of reports from the other dudes as well! I will make some campaign update posts in either case! So a bit silent here lately... well, probably not going to change for a while. But I have been writing up some rules for a simple map-based campaign that I'm hoping to run by the end of the month or so. So I thought I'd share the first draft of the rules here, in case anyone is interested. Note, none of this is tested and it is just a first version... still some stuff in my head that's not put into words yet. But perhaps it'll inspire someone! 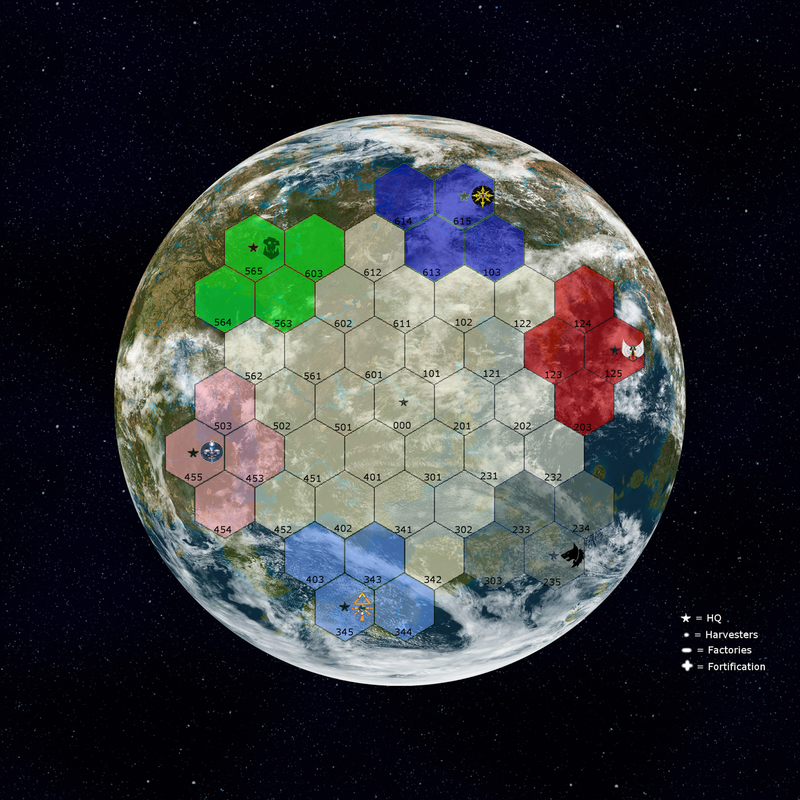 Start with a 1500p army chosen from a single faction, one HQ hex and three unoccupied hexes. Chose a Independent Character to be your Warlord, and chose a name. Each unit is persistant during the campaign. If it dies, it's gone. You can of course recruit a new unit with the same configuration, but that will cost you credits. Characters have a progression system, so even if they "die" in a fight they might continue fighting (see later) and if they survive they might improve. HQ's are always fortified (ie defended by a 1000p army, which you can use unless your army is present). If all of your HQ's are captured you are defeated. The last player standing is the campaign winner. Earn credits for each hex that has been upgraded with harvesters/factories that you control. A hex with an HQ earns you a base of 250 credits per round instead of 0. Each army can move 1 hex (unless special upgrades). Simply move to a adjacent hex. If this hex is uncontested you will now control this hex from the next campaign round. If your army is located at your HQ spend amount of credits equal to points to recruit this unit into the army. If not at your HQ, spend +50 credits for each unit that you're reinforcing to have them added to your army from a distance. Models can also be recruited into units, to increase unit size (this also includes Dedicated Transports). Follow the rules above, but instead spend +10 credits for each unit with models added if not at your HQ. An army can never be larger than 2500 points. You can also chose to spend your credits on a completely new army. It will cost 1000 credits and will consist of 1000p and it will start at one of your HQs. This army can then be added to in the normal way (above). Note: Special Character (Named Characters) and Relics can only be taken ONCE. These are supposed to be unique, so if you have two or more armies they have to chose different Characters and Relics. At this phase you can also chose to merge existing units that has survived earlier battles. If you have two units of the same kind, and at most one leader alive these two units may then merge into one single unit. *Note: HQ's and upgrades to hexes that grants a defending army are chosen right before a battle where this hex is attacked. The defenders advantage is that they have been able to scout the enemy and thus been able to prepare for them. Note that any characters in an army chosen in this way can not get post-battle experience etc. No need to roll for casualities - this is all they have at this hex, if they lose the battle all troops are destroyed. If your army lands on the same hex as an enemy army (or fortified hex) fight a normal battle (chose any mission). If a fortification is the hex that is attacked and one (or more) defending army(ies) is in a position where it can defend play multiple battles, one against each defending army. The defender may chose to combine these armies into one army, but may not exceed the 2500p limit for a single battle. Any excessive points are lost (if one of these armies are from a hex upgrade such as an HQ then this is the army that loses points). If one player has two (or more) armies attacking the same army you can play two consecutive battles OR combine armies up to 2500p total - if your total is bigger than 2500p instead of losing the points you can chose units that won't participate in this battle, they will still be part of the original army and unharmed after the battle. * If only one player chose to attack, the non-attacking player may respond by either accepting the attack or trying to evade the fight. To evade, roll a dice and on a 5-6 no battle is fought - both armies stay in place. Otherwise fight a battle, the attacker automatically has first turn for this fight. * If both players chose to attack, fight a normal battle. * You can fire into close combat if your own army is not involved in the fight, resolve wounds normally. * In close combat, you only fight back if you're getting hit this round, ie: Player A, B and C are locked in combat, but in such a way that Player A's models are only touching B's, B's are touching both A and C and C is only touching C. So in Player A's turn Player A and B fight normally, but not C. In Player B's turn all players fight. Etc. After a battle the victorious army will hold it's hex on the map. The losing army(ies) will move the minimum distance required towards their nearest HQ while still landing on a hex that is not controlled by the enemy or is adjacent to an enemy army. Ie the reteating army must stop on either a friendly hex or a neutral one. If it's a neutral one, this hex will be captured just as if the army had moved here voluntarily. If the defeated army is all ready standing on an HQ it doesn't move further. In the special case where the defending army is standing on top of it's own HQ and the attacking army has moved so that it's also standing on the same hex, the defending army is wiped out if it loses the battle. If two hexes both fulfil these requirements and are equidistant from the nearest HQ, the falling back player will decide which hex to land on. If the result of the battle is a draw, neither army moves but instead stays put where they are - except for the special case if one army is attacking an HQ in this case the attacker moves back as if it had lost. If, for any reason you can not play a scheduled game in this Campaign Round you may attempt to flee. Your army will then automatically move the minimum move required towards your closest HQ so that there is one empty hex between the attacking army and your army. Also roll a 1 for each unit in the army (but not characters), on a roll of 1 this unit is destroyed (either they got caught by the attacks or maybe they decided to desert). Keep track of each unit that is killed. If a whole unit is killed, roll a D6. On a 1-4 the entire unit is dead. On a 5-6 the unit is reduced to 50% of it's original size (rounding up). If a unit is not compeltely wiped out, roll a D6. On a 1-2 the models that died stays dead. On a 3-6 the units regains full strength. If a unit contains a medic (or equivalent) that is still alive by the end of the fight, gain a +1 to the above casualties rolls. If (parts) of the Unit survives but the leader died, roll a D6. On a 1 the leader dies, and the unit will have to buy a new leader (if wanted). On a 2-6 the leader survives and is back for next fight. If a vehicle is destroyed, roll a D6 after the battle. If it was only wrecked, a roll of 1-2 means it was not possible to salvage. But on a 3-6 the vehicle is repaired for the next battle. If the vehicle suffered a "Explodes"-result, this roll is modified to 1-4 is destroyed, 5-6 it's ready for next battle. If your army contains a Techpriest, Mek, Warpsmith etc add +1 to this dice roll. If a Character dies, roll a D6. On a 1 the Character dies. On a 2 the Character is injured and suffers -1W for the next battle. On a 3-5 the Character is good to go for the next battle. On a 6 the Character gains Feel no Pain(5+) for the next battle. A special note on Special Characters (ie those that are named in the Codex), if they roll a 1 on the above table they are gone from the campaign and CAN NOT be bought again. There's only one of them and thus they can not come back. Every Character (including unit leaders) that survive a battle might improve (this is decided AFTER casualites rolls has been made (see 3.2)). If the Character has a Special Rule that changes it's stats somehow this effect is permanent (Boons of Chaos, extra wounds for kills etc). Warlords also only roll once on the Warlord table, this result is then kept for the duration of the campaign. However, a Character that doesn't get any improvements for fighting challanges normally instead gains double XP for this challenge.